NASA still won't talk about a giant mysterious spherical object that sometimes becomes visible in the vicinity of the Sun. Now, it seems a massive unknown force disturbed NASA’s satellite H1 on November 17, 2016 which almost led to an equipment malfunction. On November 16, the satellite was still functioning normally then on the 17th something disturbed the satellite but the H1 camera still managed to capture images and one day later the 18th everything returned to normal. Images captured on the 17th show a giant spherical object which was probably the cause of the incident. Whether the object is one of the giant extraterrestrial or interdimensional spacecraft, which are accessing our solar system, using the Sun as a stargate or an unknown celestial body like the famed planet Nibiru, it is clear what happened on the 17th was not the result of an equipment failure. 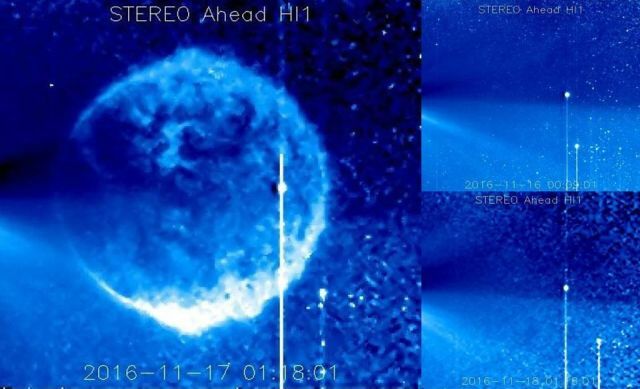 Note: Planet Nibiru – This mysterious object has been researched by Intellihub’s Shepard Ambellas for over 25 years and is likely the basis for all emergency preparations by world governments which we’ve seen transpire over the last three decades after the object was discovered during the Regan Administration by NASA’s IRAS telescope.